Lilith has given her name to several astronomical entities of very different natures. There are three, even four, Liliths. Thus she demonstrates the nature of the triple goddess, and adds a fourth dimension. One Lilith is an asteroid, number 1181, orbiting with most of the other asteroids between Mars and Jupiter. The asteroids, considered fragments of a one-time planetary body, are facets of a larger whole. The asteroid belt is a thicket of archetypal material. 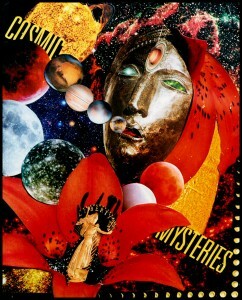 I think of the female-named asteroids as various aspects of the Great Goddess. In this view, Lilith is one of the most ancient. The symbol for asteroid Lilith is a stylized hand, signaling warning, greeting, or blessing. The hand is one of the most ancient symbols used by humans, seen on petroglyphs and in cave drawings. Eastern images of gods and goddess show hand gestures, called mudras, that convey meaning. Perhaps the meaning of Lilith¹s hand signal depends on how one approaches her. Asteroid 1181, the most solid-bodied Lilith, orbits the Sun in around 4 years. In the classic book, Asteroid Goddesses, Demetra George and Douglas Bloch discuss the mythology of asteroid Lilith in relation to issues of suppressed rage, resentment, sexual manipulation and self-exile. She is a fiercely independent goddess who refuses to submit to the assumed authority of another, to compromise her beliefs. As the original, first wife of Adam, created from the same God Power and the same Earth, she demanded an equal relationship. The man was not strong enough to agree, at least in that version of the story, at that time in history. That¹s over 5,000 years ago. We¹ve come a long way, baby? She asks us to deal with confrontation and issues of equality in relationship. The asteroid seems to represent split off, demonized aspects of the feminine, the result of long-standing cultural projections that perceive powerful feminine roles and attributes as shameful, untrustworthy, and dangerous. Our personal Lilith placement may show where we struggle with social judgments that define how the feminine qualities should be expressed in order to “fit in.” It is the point where we may most need to cast off socially-imposed role models of the feminine that deny her true instinct and vitality. These cultural definitions define us, but are not us. Here we may not be seen clearly. A prominent asteroid Lilith placement in the birth chart may indicate a person who does not fit the cultural stereotype, leading to some kind of exile from the community. Some say there is a second moon circling Earth–a mysterious dark moon. The Dark Moon has been reported for centuries, as far back as September 2, 1618, according to Delphine Jay in her book, Interpreting Lilith, placing this important sighting appropriately in the season of the Virgin Goddess. This Dark Moon is a second satellite of the Earth, one that is rarely seen because it reflects no light and can only be sighted on the few rare dates when the sky is dark and Lilith Dark Moon is either in opposition to or crossing the Sun¹s face in conjunction with it. It is one-fourth the size of our familiar Moon, say astronomers who have viewed it, and three times as far away. It takes 119 days to orbit the Earth, about 10 days per sign. Why haven¹t we heard more about this second Moon? Perhaps it is the nature of Lilith. Her existence has not been completely verified. Dark Moon Lilith is like a sphere of dust, absorbing light rather than reflecting it. She holds in her darkness. Sister of our Eve-like Moon, they are like the bright Sumerian Goddess Inanna and her dark sister, Ereshkigal, exiled in the underworld. After her honeymoon fails to provide the happily-ever-after romantic dream, Inanna descends to her sister¹s realm, the underworld of the unconscious where the rejected Ereshkigal cries in pain and anger. The Dark Goddess takes one look at her luminous, beautiful sister who has gathered all the light and fixes her with the eye of death, freezing the growth of consciousness in the paralysis of repressed pain. Giving expression to the pain in some form releases us from our (often self-imposed) imprisonment in negative emotions. Lilith shows us the way, but she does not come out gently from behind her veil of night. According to Delphine Jay¹s research, the effect of Dark Moon Lilith is distinctly impersonal rather than subjective as with the Moon. Whereas the reflective Moon represents personal, subjective feelings, the Dark Moon represents a primal, objective, impersonal instinct that seeks identification beyond the physical and emotional realms. “This is the way it must be,” she says clearly and definitively, like one of the Fates, the triple goddesses of karma. When her expression is denied or self-centered, she can be quite negative; when the emotional content is channelized into higher centers, she adds power to creative, mental or aesthetic expression, even to spiritual practice. “Lilith strictly symbolizes the objective thinking approach. Anything less is unsuccessful.” (8) The Dark Moon point is where we are lured into our more self-centered illusions for the purpose of purging negative desires and grow beyond our habitual patterns of early Moon conditioning. Perhaps the most subtle and intriguing of the three Liliths, Black Moon is not a physical body but an abstract, geometrical point, like the Ascendant or the Vertex. It is the second center of the Moon¹s elliptical orbit around the Earth. An ellipse has two centers, rather than one like perfect circle. The Earth is one center and Black Moon Lilith is the other. Another way to describe this point is as the apogee of the Moon¹s orbit–the place where it is the farthest from Earth. The center of gravity between the Earth and Moon is inside the Earth. As part of the Earth-Moon system, Black Moon is a point or energetic vortex intimately bound to the center of the Earth. Black Moon and Earth are the two centers or the double center, around which the Moon orbits. Lilith is a twin to the core energy of the Earth, the deep heart of fire. This is the central fire that feeds and sustains our Earth bodies. The creative vitality of the Sun gives life to the Earth and fuels this central core fire. The center of gravity between the Moon and Earth is within the Earth. It is as if Black Moon pulls away from that center and brings the Moon closer to the Sun, Black Moon being the furthest point of the Moon from Earth. Psychologist Robert Sardello, author of Facing the World with Soul, tells a story of Sophia, the feminine divine essence, always seeking union with the Spirit of God. The light of God was so brilliant, she was moving toward that, attracted to it. Then she was distracted by an equally bright light. She found herself trapped inside Earth, incarnated in physical matter, that is equally as divine. This central flame is the heart of Earth and sustains the spiritual life of Earth, as the materiality of earth nurtures and sustains our bodies. This flame reaches out from the center of Earth through all living beings, ever longing to merge with the Spirit of God. Found in the darkness, we seek her in the deepest recesses of our Selves. This is the impulse for the sacred inner marriage. As a center point of the Moon¹s orbit, Black Moon Lilith works in relationship with the Earth-Moon system and with the Sun. As a second center of reference, she gives a sense of rhythm to the Earth, taking the dynamics of relationship beyond the personal Moon-Venus energies into subtle dimensions that are essential to our reasons for being on and of Earth. Representing the closest reach of the Moon to the Sun, she is also a reference point in our personal lives that brings us into relationship with the heart of our Sun-fueled experience on Earth, an emotional intelligence informed by the wisdom of earthy instinct. Since our culture has lost, even rejected as Lilith was rejected, this kind of natural wisdom is more difficult to tap into and trust. In this regard, Black Moon Lilith can have a strong impact of relationship dynamics. Relationships that involve Lilith energy are initiatory, soul-to-soul meetings that open into a deeper center where personal and impersonal experience merge. Can we trust this energy that is unraveling our edges, tapping into such a deep well? Can we trust ourselves? The Black Moon point is where we are lured into the mystery. She insists that we feel through, let go, surrender to something essential and transparent in us that is primary, the bedrock beneath the shifting sands, the passion of the soul. It is a corridor into the heart through which we are lured to discover our deepest truth, the longings and yearnings of our souls and thereby leading us to the deeper truth within our heart, the longings and yearnings of our souls. As I go into the Earth, she pierces my heart. As I penetrate further, she unveils me. When I have reached her center, I am weeping openly. I have known her all my life, yet she reveals stories to me, and these stories are revelations and I am transformed. Each time I go to her I am born like this. Her renewal washes over me endlessly, her wounds caress me; I become aware of all that has come between us, of the noise between us, the blindness, of something sleeping between us. Now my body reaches out to her. Black Moon symbolizes a central motivating factor that is subtle, unseen but felt. This Lilith taps into an urgent desire of the soul that seeks dramatization in life and will brook no denial. In a time such as ours of potent change, the Black Moon, with its underlying creative life force and spiritual impulse, illumines the inner pathway with the most heart for each seeker of Truth and Love. Stellar Lilith, in the realm of the fixed stars, is located at 25 Taurus 28 in relation to the zodiac and culminates, or reaches its height in the sky, at 18 Taurus. Both of these points are potent Algol degrees, creating another kind of Lilith corridor. You may have your own position for Algol rising or setting, depending on where you were born. (see Brady) This star brings us into a large mythic drama, that involves Perseus and Andromeda, Cassiopeia and Cepheus, Pegasus and Cetus. The well-known Greek story has more ancient roots in Ethiopia and Libya, in the prehistory of the Amazon culture and the High Priestesses of Africa, revealing more dimensions of the power of the Great Mother. I find the three Liliths intriguing as a mirror of the triple goddess–and the star brings the trinity into a fourth dimension. Essentially Tantric, Lilith in her several forms transforms subjective to spiritual. Her impersonal energy opens transparent areas of the mind, not clouded by the weight of collective Judgement or limitations of ego identity. The three aspects vibrate at different frequencies, in chords and octaves, opening channels to clear and spiritualize the emotional body. Dark Moon has the fastest orbital cycle, like a cloud passing across the Sun. With its very existence veiled in shadow, Dark Moon relates to highly individualized soul desires that are denied personal satisfaction for higher expression on social/spiritual levels. The asteroid is not connected to the Moon as are the other two Liliths. It has an orbit of somewhat over four years and is the most embodied, a verified object with an official number. Asteroid Lilith about repressed elements that want full embodied expression, relating to issues of sexuality, anger, assertion and conflict resolution. Black Moon is an energy vortex, an ancient pathway into incarnation and sword of truth. Its orbital cycle of eight years, ten months, coordinates with the Moon¹s nodal cycles. Black Moon has deep instinctive intuition, will and desire power that can weave matter out of ether. Perhaps that why she comes in dreams, when our bodies and rational minds are asleep. Our thoughts are then turned off and she can whisper her secrets in images and even, perhaps, transport us to other realms. She is a weaver of the etheric and the physical, like the warp and woof of the loom. She weaves together the collective and the personal, as the myth becomes our experience to regenerate. The Lilith Star, Algol, brings the energy into another dimension. Seemingly immortal in the ancient field of fixed stars, it contains a collective dimension of Lilith, that fixes her Eye on us dispassionately, winking mysteriously.